This short video can be found on the Special Features disc of the Dr. No , Ultimate Edition DVD and it gives us a brief look at what went in to the Lowry restoration of the movies for the James Bond Ultimate Edition DVD Box Sets in 2004. The original film camera negatives were scanned in 4k on an Imagica film scanner , which took 4 seconds per frame. As with many DVD and blu-ray releases, not everybody was happy with the way these turned out. Film lovers lament the lack of film grain, which was greatly reduced by scanning the original camera negatives and then further reduced by the noise reduction process. Those used to seeing the films for years on VHS and laserdisc, find the vibrant, (perhaps overly) saturated colors just, well, wrong somehow. As they say in the documentary, they no longer seem to be a product of their time - that is they no longer look like movies made in the 1960s, instead they now look like films set in the 1960s. Finally, there are those who believe it would have been far better to hire a company that could have done a frame by frame, manual restoration of the films rather than running an automated algorithmic digital process to clean up the dirt and scratches, which often has unwanted and unexpected results, particularly in scenes with lots of motion. I haven't noticed any such artifacts in the lowry James Bond films, but I haven't gone through them frame by frame either. According to the video, they didn't just load the film into their "proprietary software" and click Go, they did at least separate the shots based on whether they were inside or outside, or had optical effects, and adjusted the settings accordingly. No one, even those at Lowry, would argue against the idea that a 100% manual clean up would yield slightly better results, but the fact is that even if they had half as much computing power and three times as many skilled employees, Lowry might still be working their way through the Bond films today if they had chosen to rely on manual clean up alone, and that would have cost MGM Millions of dollars, and of course we know MGM didn't have enough cash for that because it was sold so many times and ultimately went Bankrupt in 2010. Lowry Media takes a lot of stick about how the "Original" Star Wars Trilogy turned out on DVD, but after watching this it seems likely that it was almost certainly George Lucas, or at least somebody at Lucasfilm, who demanded the overly saturated color palates intended to more closely resemble the largely CGI Video Game like prequels. 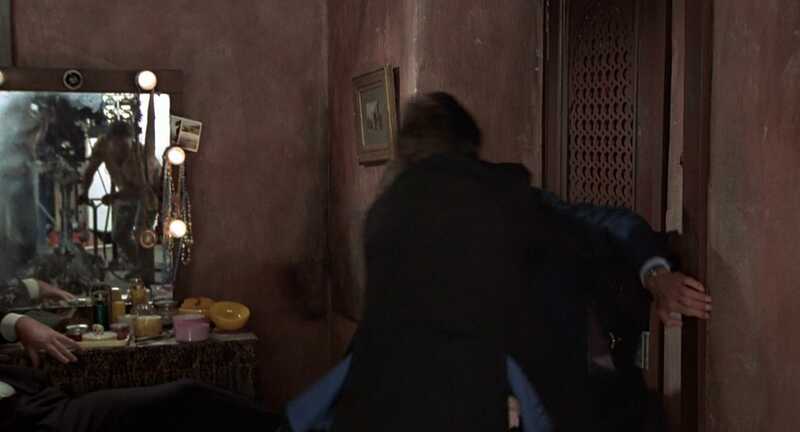 Here we learn, for instance that MGM and DanJaq representatives were consulted frequently and not only when there were things that could be fixed which would change the original film, such as when the mirror gets knocked during the fight in the dressing room near the beginning of The Man With The Golden Gun . After the mirror is moved, the camera crew and other behind the scenes personnel are clearly visible. Lowry could have "fixed" things like that digitally but asked MGM what they would like to do. To their credit (or perhaps because they couldn't afford it), MGM said leave it alone. Personally I would have preferred to see a little film grain, but on the whole I think the Lowry processed James Bond DVDs and Blu-rays look fantastic.